Someone once told me that Innovation isn’t thinking about bright new ideas but using ideas from one section and applying it to another. Several innovations that I came across in India truly fits the description. Let’s see some of them and how they impact our society. Nothing new, but I always thought they are fascinating element in India’s business ecosystem which is missing in metros and most countries abroad. In today’s super-busy lifestyle, I find it awesome if someone can come to my house for fixing my gas stove or to sell vegetables. Hats off to these innovators (like one below) which meet my needs and also figured out an innovative way to sustain. Now this one will really surprise you – A paper which is made from Elephant Poop. It is environment friendly and completely organic. Infact, this Indian innovation has become a rage in countries abroad. Have a look at their website http://elephantpoopaper.com/ and read the story on how this came about – Fascinating I must say! To operate the irrigation pumps, villages and rural locations in India are often marred by fluctuations in power supply, difficult terrain, fear of animals on the way to pumps, hazardous locations of the pumps along the river or water storage beds, shock hazards, rains etc. Nano Ganesh is a GSM Mobile based remote control system exclusively for the use with water pump sets in agriculture areas. The need of Nano Ganesh aroused from the routine problems faced by the farmers in operating the pumps. A farmer has to simply dial a number dedicated for a Nano Ganesh set and then punch his on or off code for the control of the pump set. It can be connected to any existing electrical starter and motor pumps. Hence, there is no necessity of replacing the pumping set. With bulk of our GDP coming from agriculture, I think products like Nano Ganesh are super-important to keep the sector blooming. Ever thought about a washing machine made of junk which runs on mechanical and kinetic energy? Well, Sourabh Siyal and Tushar Agarwal, students of Christ College, Bangalore definitely did and invented Eco-wash. To me the machine is a revolution because it is cheap and environment friendly at the same time. 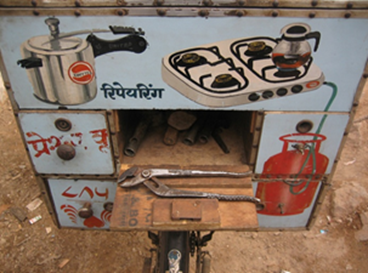 It can be of great potential usage in Indian rural areas where electricity is scarce. Even in industrial areas it can be useful and cost effective. I haven’t seen a better marketing campaign than this. 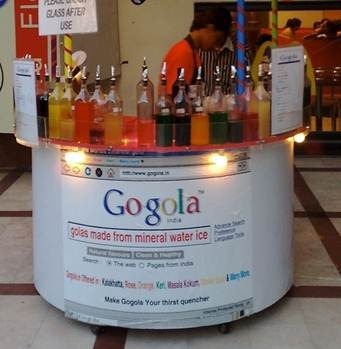 It’s amazing how they have utilized Google’s popular brand image and used it to sell golas (snow-balls)! This one was by Childcare, India when they wanted to create awareness about child beggars in India. I think it captures the emotions beautifully which makes it innovatively effective. Obviously, these are just very few examples of innovation in India, but I am always excited to see how we Indians learn from different sections of our society and utilize this knowledge in our lives. I guess that is what drives us together as a nation and I have no doubt that many more innovations are yet to come. Would love to hear about such unique India-centric innovations that you may have come across…let us know. "Unique Innovations in India", 5 out of 5 based on 1 ratings. Horlicks new look, logo and packaging – Strategy Shift? fantastic collection of innovation in India.Thanks to bring it in light………………….. Awareness idea about child care is fabulous. I also invented a low cost hand made folding bicycle for common people with all the features a foldin bicycle should have. GOOD MORNING, I am I.V. SUBBA RAO, I have developed advanced new technology, it is named as iron ore pellitization.. Still it is not introduced in India for small medium and major sponge iron manufacturing industries. We are planning to set up 50 T.P.D Commercial production plant, its cost is 27 Cores, but we are not financially sound enough. We have applied for patent rights on JULY 2008, regarding this technology so many domestic and other country small scale sponge iron manufactures are contacting through mails and through phones. Lot of customers is interesting to utilize our technology, while before that they want to see the operation plant. If I set up 50 TPD plant i.e., both ways it is like to pellet plant as well as commercial production plant. If any one help for us financial loan of Rs 24. 0 Cores (Indian currency). I will set up the plant as early as possible (6.0 to 9.0months). Through this technology small, medium and major sponge iron manufacturing industries (Karnataka, Orissa, Jharkand, Chatisgarh, West Bengal and Madhya Pradesh) can use this iron ore power easily. Because of this technology sponge iron and steel manufactures can get lot of marzines / profits, the Indian Sponge Iron /DRI Economic growth turn over gone up to 1,00,000 Cores per annum. This product (fines using) is burning problem of India and aboard for sponge iron and steel manufactures. This is unique technology; I have received so many mails with in short time in India and abroad. PERSONNEL NOTE: – OUR PATENT IS UNDER PENDING. Nice one. Here is my two paisa. This time three paisa. However I think you have missed the master of innovations. His name is Rajni Kant. Full Name : There is nothing that RAJNI CANT innovate. Innovations were innovated for the first time in India by Rajni Kant. Rajni utilizes the available resources available at that time to execute the task with maximum efficiency. Case study 1 : Rajanikanth is confronted with 3 gangsters. Rajanikanth has a gun but unfortunately only one bullet. He holds a knife in his hand and throws at the middle gangster..& shoots the bullet towards the knife. The knife cuts the bullet into 2 pieces and kills both the gangsters on each side of the middle gangster & the knife kills the middle one. he has no bullets in it. opens the bullet compartment of his revolver and catches the bullet. Then, he closes the bullet compartment and fires his gun. Bang… And the gangster dies…. his second gun. Now the first gun fires off and the villain is dead. Quite insightful post…..particulary haathi chaap paper & eco wash.